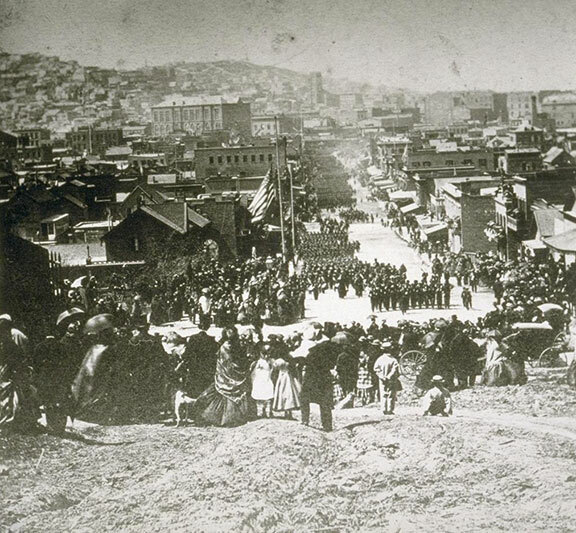 Difference between revisions of "Contesting the History of Early American California"
Smith offers a wider view of the struggle over different labor regimes during the pre-Civil War decade through the end of Reconstruction in the mid-1870s. Her argument penetrates the fraught beginnings of wage-labor in the pre-Civil War west, and how the struggles over the definition of free and unfree labor came to shape the national discourse by the end of Reconstruction in the mid-1870s. She includes detailed accounts of slavery in California, backed up with many examples and evidence from the press of the time. She goes through the legal battles in the state legislature that led to the passage of the 1850 Act for the Government and Protection of Indians and the fugitive slave law that together rendered California’s ostensible status as a “free state” a mendacious claim at best. Californios and Indians were here when the border suddenly shifted hundreds of miles southward, but were quickly defined as “other.” Even legal protections for Californio landowners embodied in the peace treaty that ceded so much Mexican territory to the U.S. were often ignored or rejected in practice as squatters and settlers overwhelmed the smaller population of long-time residents. The indigenous peoples of California were subjected to a horrific genocidal campaign that lasted into the 1870s, killing tens of thousands, enslaving men, women, and children for decades. Later generations of American Californians imagined that California’s physical landscape and remarkable abundance was just sitting here awaiting the pioneers’ arrival, rather then understanding that it had actually been <i>produced</i> by the people who had lived here for thousands of years, and those people lived on the land that was coveted by the incoming Americans. Several excellent books shed light on the complicated, contradictory, and ultimately barbaric process of making California American. Benjamin Madley’s magisterial [https://yalebooks.yale.edu/book/9780300181364/american-genocide ''An American Genocide: TheUnited States and the Californian Indian Catastrophe 1846-1873''] is the go-to book to understand the day-by-day slaughter and enslavement of California Indian peoples during the first decades of American political control. It’s grim reading, but well written and strips bare the barbarism that white Americans imposed. Where Benjamin Madley details every murder and so-called “militia” campaign against California Indians in all parts of the state for 30 years, Stacey Smith looks more closely at the way state laws fueled a burgeoning trade of buying and selling Indians, especially those under the age of 21. She also presents a number of galling examples of state courts approving the re-enslavement of free blacks and their export back to slave states. By 1855 cracks in the legal system began to appear, as various formerly enslaved people were freed by state courts on the grounds that they had been held illegally as slaves in California. (Some were encouraged to seek their legal freedom by armed blacks, already free, who traveled through San Joaquin county exhorting slaves to run away.) Judges agreed with lawyers who argued that if they had been brought by their owners after 1850, and had not sought to escape in their original slave state or en route, then they had not broken any laws by running away in California. Yearly campaigns by slave owning southern Californians to separate California into two states were thwarted by anti-slavery votes in the state legislature. There were estimated to be nearly 3,000 enslaved African Americans in California, one-quarter to one-third under the age of 21, during the 1850s. 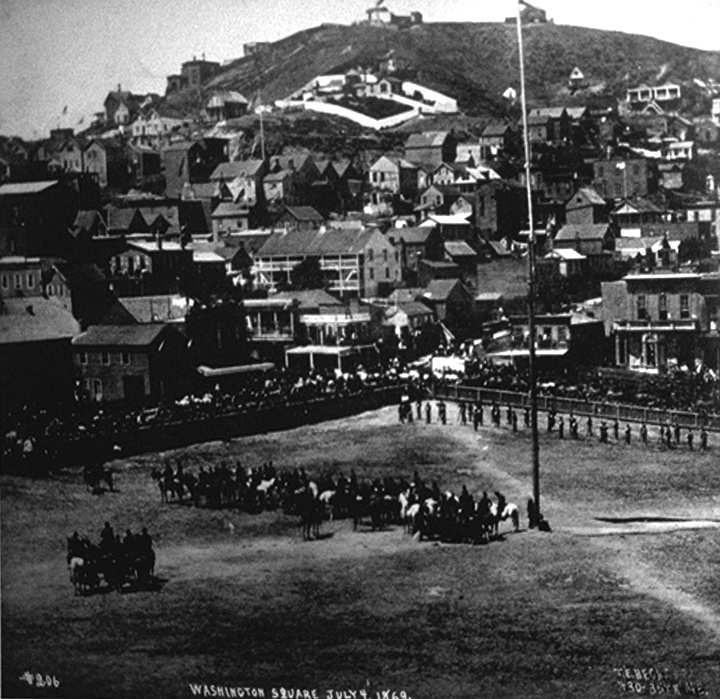 When the Civil War started, most Californian slaveowners returned to the south to fight for the Confederacy (along with a number of well known San Franciscans such as Senator William Gwin and the celebrated Lillie Hitchcock Coit). Holding African American children as “wards” also gave white slave owners additional leverage over their enslaved parents, who were less likely to run away and leave their children behind, and were also less likely to resist their work demands. The hidden slavery of children is probably one of the least known aspects of 1850s California. One quarter of northern California households had a slave Indian child in the home during that decade, according to Madley’s research. This new legal regime was used repeatedly in the late 19th century to block social legislation that emerged in state and national governments. Regulatory legislation that curtailed sweatshops, required wages to be paid in cash rather than company scrip, mandated shorter workdays, provided various health and safety requirements, and much else, were systematically blocked by the courts. According to White, more than sixty labor laws were struck down between 1880 and 1900. 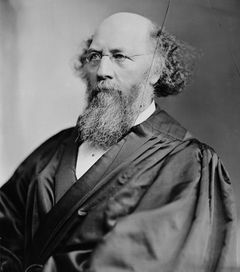 The current successful campaign by the reactionary Federalist Society to pack the courts under Trump with right-wing ideologues has a strong corollary in the original Gilded Era’s activist courts. It is ironic that the right-wing campaign to take over the judicial branch of government began with claims that liberal judges were “activists” who were inventing legal rights and not sticking to the original intent of the Constitution. But it was the pro-capitalist judges of the late nineteenth century who were the original activist judges, inventing legal precedents that still constrain us today. Corporations and the wealthy who control them, along with their political enablers, have built an edifice that will have to be taken down if we have any hope of altering the course of history. Imagining California as a bastion of progressive thinking, a “liberal paradise” if you will, demands that we delve deeply into its original white supremacist DNA, and that we unpack the real historic meaning of liberalism. Today’s battles with a resurgent right have only just begun. A future freed from not just the revanchist reactionaries who dominate national politics, but also freed from California’s own sordid history, requires a clean break with the political and legal regime that still shapes our options as we near the third decade of the 21st century. The Fourth of July being celebrated in Washington Square Park, 1869. It’s not even 200 years since the American seizure of California from Mexico. 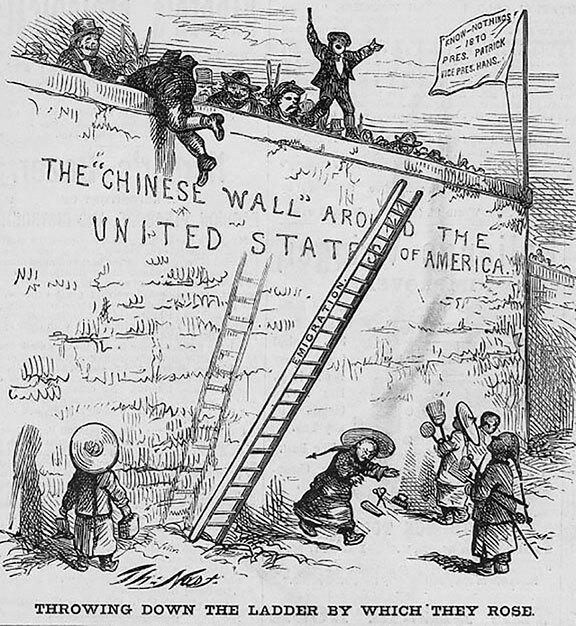 As Americans poured into the territory seeking their fortunes they aggressively sought to implant a political and economic order that ensured their own well-being and denied it to every everyone else. But they also faced the deep anxiety that accompanied the shifting economic world they were bringing with them, the beginnings of industrial capitalism and wage-labor. The mythological small farmers and self-made men found themselves dependent on wealthy investors and new business syndicates that employed them in seizing the natural wealth of California. While a few became unimaginably wealthy, most American California settlers were boxed in by lack of capital and a lack of land, forced to find employment with those who could command their labor with wages. Early sentiment for wall building! "Protecting the Settlers?" 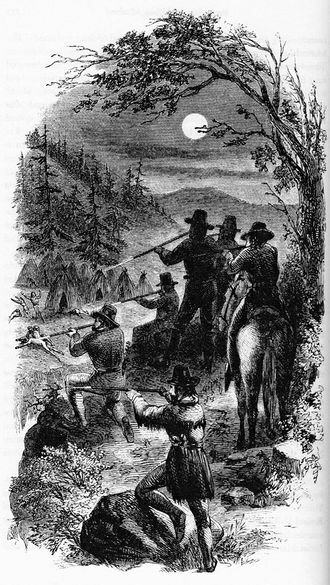 This image from Harper's in 1871 depicts the slaughter of California Indians in Round Valley, Mendocino County by a brutal local "militia" paid for by Serranus Hastings, namesake of Hastings College of the Law. Californios and Indians were here when the border suddenly shifted hundreds of miles southward, but were quickly defined as “other.” Even legal protections for Californio landowners embodied in the peace treaty that ceded so much Mexican territory to the U.S. were often ignored or rejected in practice as squatters and settlers overwhelmed the smaller population of long-time residents. The indigenous peoples of California were subjected to a horrific genocidal campaign that lasted into the 1870s, killing tens of thousands, enslaving men, women, and children for decades. Later generations of American Californians imagined that California’s physical landscape and remarkable abundance was just sitting here awaiting the pioneers’ arrival, rather then understanding that it had actually been produced by the people who had lived here for thousands of years, and those people lived on the land that was coveted by the incoming Americans. Several excellent books shed light on the complicated, contradictory, and ultimately barbaric process of making California American. Benjamin Madley’s magisterial An American Genocide: TheUnited States and the Californian Indian Catastrophe 1846-1873 is the go-to book to understand the day-by-day slaughter and enslavement of California Indian peoples during the first decades of American political control. It’s grim reading, but well written and strips bare the barbarism that white Americans imposed. 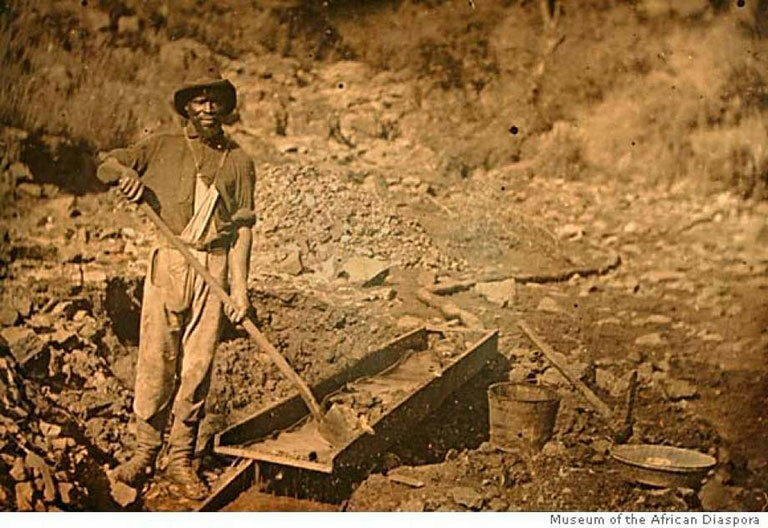 A widely reproduced image of a black gold miner during the Gold Rush... was he free or a slave? 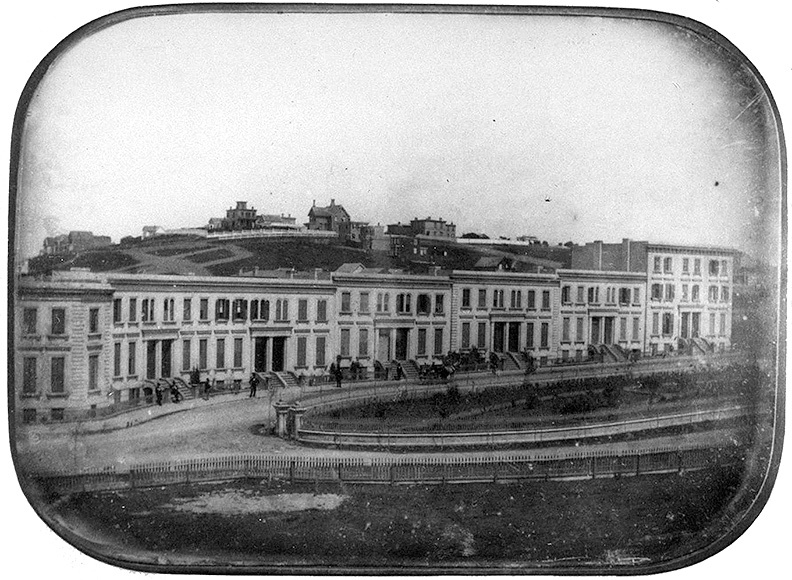 Mourners march on 2nd Street in San Francisco after Lincoln's assassination. 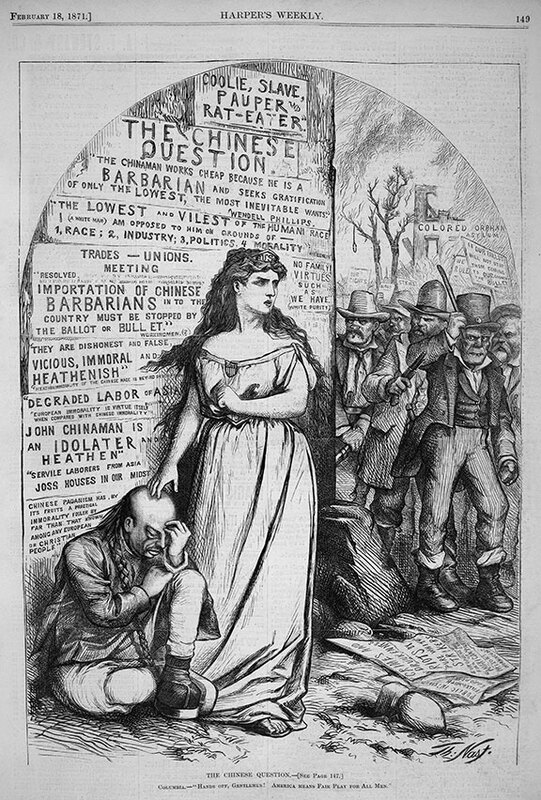 More racist propaganda, Feb. 18, 1871.